Barley Grass is a natural blood cleanser that helps detoxify the liver and increase the amount of chlorophyll in the body. It is rich in vitamins, nutrients and amino acids, making this super food a great resource for helping the immune system and boosting nutrient levels in the body. 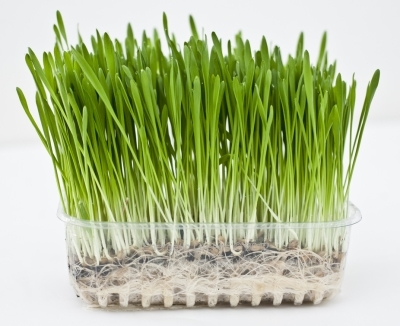 Barley Grass is an alkaline food, regulating the level of pH in the bloodstream. It assures healthy brain function and cell wall development. Due to its high levels of Omega essential fatty acids, Barley Grass offers powerful anti-oxidants to the body while remaining gluten free. With high levels of antioxidants and beta carotene, Barley Grass brings many benefits to those looking for a healthier lifestyle. Vitamins and minerals in Barley Grass include magnesium, zinc, B group, beta carotene, copper, folic acid, potassium and calcium. Barley Grass is an alkalizing food! A balanced alkaline level in the body is important for decreasing the acidic effects of poorly processed foods, sugars and animal proteins. Since these foods increase acid in the body, it is necessary to find a source of alkalinity to counteract these foods. With green barley you can maintain a solid alkaline level and thus decrease the effects of acidity from poor eating habits. Barley Grass works great in powder form, making it highly versatile for putting on different food dishes. For example, you can sprinkle the powder on foods such as soup or casseroles, while it is also a great addition to juices and smoothies. IF YOU LIKE BARLEY GRASS, THEN YOU’LL LOVE VITAL GREENS!